Over the years, the use of the word ‘spiritual’ in business has been largely frowned upon. Spirituality is often equated with being floaty, unrealistic or ungrounded. In a corporate world that still tends to value analysis and reasoning over intuition and instinct, we have been actively encouraged to leave any spiritual practices out of the boardroom. We probably won’t hear many CEOs declaring their allegiance to angels or asking for advice from their guides. It’s simply not the done thing — well, certainly not out loud! Because using the ‘s’ word has been largely deemed inappropriate, we have been forced to find more acceptable business-style language. We speak of finding our flow, being in the zone or receiving inspiration. But what is inspiration if it is not being in-spirit? Are we really saying that bringing more spirit to business is unacceptable or unwelcome? With an increasing emphasis on practices like mindfulness and meditation, isn’t it time for a change? No longer the reserve of New Age books, these topics have found their way into mainstream media. Back in May, the Financial Times examined the impact of breathing and mindfulness on stressed out bankers and The Guardian recently printed practical guides for incorporating such techniques into our lifestyles. With the shift in acceptance of these practices, are we ready to openly declare our allegiance with spirituality or does using the ‘s’ word still leave us open to judgment or questions around our competence and reasoning capacity? There is a new breed of creative business leaders that are doing things differently. They know today’s business challenges cannot be solved by downsizing, cutting budgets or beating the competition. These leaders are owning their spirituality and valuing vision, intuition, presence and collaboration over drive, opposition and force. Kevin believes that if you can define a vision, spiritually connect with the outcome and let it live and grow in your soul and psyche on a daily basis, then you have found the absolute key to success. So why does the idea of spirituality turn some people off? Perhaps they picture a self-proclaimed new-age guru sitting on a mountain top chanting! Or worse, perhaps they associate it with religion or cults, and they fear that by engaging in spiritual conversation they will be sucked into an endless stream of righteousness. Or maybe they imagine a door-to-door caller who won’t leave until you have agreed to their principles. No one wants this level of uninvited intrusiveness. But the true essence of spirituality couldn’t be further away from this. Spirituality has nothing to do with an external belief system in the way that religion or cults dictate. Rather it is a personal interpretation – an inner connection between mind, heart and soul. We can only ever know our version, never decree what another should or shouldn’t believe. As soon as I ask you to think or do something against your own values and principles, I am no longer led by spirit but firmly attached to the ego’s needs for validation. Spirit never requires external corroboration. It knows its own truth. 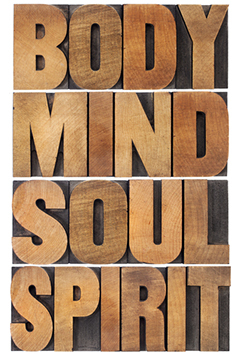 I like to think of spirituality as being the absolute em-body-ment of living an inspired (in-spirit) life. It is the ability to move out of the analytical mind and drop into your core, inhabited by your heart and soul. It doesn’t discount intellectual reasoning but uses its functionality to fulfill a deeper level of purpose. In this alignment you find your passion, peace and joy. The rules about spirituality are that there are no rules! Being spiritual doesn’t require you to meditate daily, visit a church or temple, take up yoga or change your diet — unless you want to. You are just as likely to connect to your heart centre and spirit whilst walking your dog, playing sports, listening to music, baking or gardening. Any activity that brings you present to the moment and in deep rapport with your self could be described as spiritual. Sharing that you believe in something more than can be intellectually understood won’t always win friends and support. But if we are going to live spiritual values, then we need to find ways to share the truth of who we are — even if we risk being labeled as weird or crazy. As a business leader, spirituality better connects you to your authenticity, integrity and wisdom. When you strengthen your relationship with your soul, you build an unshakable foundation that cannot be disrupted by any drama or dilemma. When you operate from your heart, you cultivate trust and consistency that inspires those who follow you. And when you are connected to spirit, you have an inner guidance system that keeps you on track, making decisions and choices that are always in alignment with your highest intentions and outcomes. Rather than being a word to suppress and conceal, your spirituality may be the very thing that secures your ongoing and unlimited success. Now, is that something worth talking about?